48/48 Kim Hollis Would The Number 23 live to kill another day? Could I be bothered to care? 50/50 Michael Bentley Reaches new lows for absurdly idiotic and stupid plots. It's a complete failure of a story. 94/94 Shane Jenkins "The lamest movie of the year." Whoa, that was 23 letters! Spoooky! 131/214 Max Braden It's not just Carrey that doesn't feel right. The cinematography and direction feel off. Do not get overly excited when you see the title of this film. It is not a movie that features a series of career highlights from the awe inspiring Michael Jordan. No, instead it is a Joel Schumacher film. Despite stuff like Batman & Robin, he sometimes gets one right, though. Phone Booth wasn't a disaster and was even generally entertaining. There seems to be some hope for The Number 23, as it stars Jim Carrey in a dramatic role. 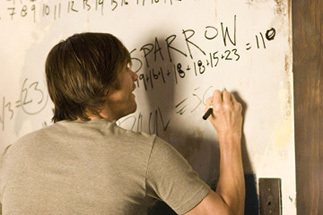 The psychological thriller has Carrey's character freaking out as his life comes apart when he comes into contact with a book named The Number 23. When he reads it, he starts to be more and more convinced that his own life is the bases for the story. He becomes obsessed, and soon realizes that the book's dark omens about his life are even more dire than he even knew. See the latest developments for this project on the The Number 23 Movie News page.